We are delighted that you are thinking of having your child christened / baptised (two words for the same thing). Your child’s baptism is a very important occasion both for the Church and for your family, and one that we in Rushen Parish take very seriously. Baptisms take place within the main Sunday service, and you have a choice of any of the four churches. We hope that it will be a happy and memorable time for all concerned and, like everything else important in life, your child’s baptism will require careful planning and preparation. We will take your contact details and arrange to meet with you so that we can explain what the church offers for children and young people and also let you know the next steps in the process of preparing for the baptism. 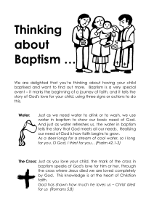 We have prepared a short booklet that briefly describes baptism. The vicar will answer any of your questions about the service, faith or facilities that we have to offer when he comes to visit. The first thing you need to do is to complete an application form and email it to our Parish Administrator. Click here to download the form. Should you have any queries in completing the form please do not hesitate to contact the Vicar, or the Parish office. Begin coming to church so that we can get to know you ! Who can be a Godparent ? You can have up to four Godparents. Traditionally, there are at least two Godparents of the same gender as the child and one of the opposite gender (though this is not a hard-fast rule). Godparents can be family members or friends. However, it is important that you choose people who will take an interest in your child's spiritual life and who will pray for you and your child. They should be baptised themselves and mature enough to act as a Godparent. What happens if one of the godparents can’t come to the Baptism ? We’re not married – can our child still be baptised ? Can older children or adults be baptised ? Yes. If you are considering this, please have a word with the Vicar. We don’t live in Rushen Parish - can we have our baby baptised here ? It is usual to have your baby baptised in the parish where you live so that your child can be welcomed and grow in your local church family. However, if there are particular reasons why you would like to have the baptism here (e.g. family links), it may be possible to arrange with the agreement of your own local minister. Click here for more information about baptisms/Christenings on the Church of England website. Please do not hesitate to contact us at the Parish Office if you have any questions, or if you need any more information.